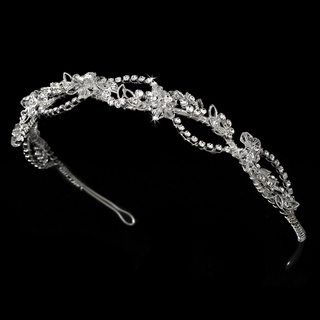 This headband features sparkling Swarovski crystal flowers on a braided vine of rhinestones with rhinestone-encrusted leaf details. This piece would be a dazzling addition to any classic, modern, or vintage wedding! The ornamented portion of the piece measures 9" wide and 3/4" tall. Pin loops are included on the ends of the band to allow you to fasten it into your hairstyle with bobby pins.